In Books Tagged In hard rock miners, Labour History, Mick Lowe, Nickel Range Trilogy Range Trilogy, Sudbury, Trade Unions, and working class literature. September 1978. 11,700 hard rock miners and smelter and refinery workers at Inco’s Sudbury operations face a stark choice. Should they remain on the job? Or take seemingly suicidal strike action against a huge multinational that has stocked up enough nickel to last a year? A fateful choice is made. It changes the lives of newlyweds Jake and Jo Ann McCool and the Canadian labour movement forever. Against a backdrop of unrelenting winter and swirling changes in social mores, the ensuing struggle triggers epical challenges few could have foreseen. 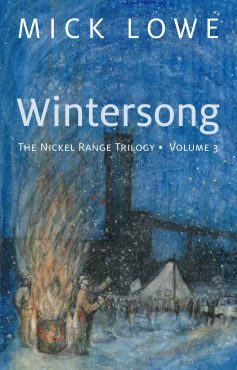 The third and final volume of Mick Lowe’s sweeping Nickel Range Trilogy, Wintersong, is working class literature at it’s best, echoing the great tradition of writers like Upton Sinclair, Theodore Dreiser, Steinbeck and Dos Passos. Mick Lowe is a prolific journalist, writer and newspaper columnist. Author of the true crime classic Conspiracy of Brothers: A True Story of Bikers, Murder and the Law, he has lived in Sudbury since 1974 after immigrating to Canada in 1970 from the United States. The first two volumes of the Nickel Range Trilogy are The Raids and The Insatiable Maw. Thank you to Cathy Mulroy for sharing her stories from her own memoir book My View from the Blacken Rocks. The character of Molly was inspired by real life events that occurred during the 1978/79 strike in Sudbury, Steelworkers 6500 vs INCO. Thanks also to David Patterson. Without their help and that of many others, this work of fiction would never have been able to capture the nature and temperament of the strike from beginning to end. The courageous sacrifice and solidarity of the thousands of Sudbury men and women inspired this story. They could not be broken by any force that attempted to conquer or divide them for 261 days. The author hopes that this book will help make their story be known to future generations.